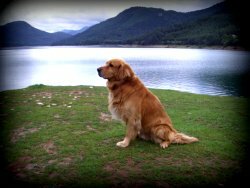 Anyone who has ever owned a Golden Retriever will tell you just how wonderful this breed is as pets for anyone of any age with any size family. They are calm, serene and happy dogs that love human company and get along well with other family pets. Unfortunately, this popularity has led to over breeding by owners who don’t have the breed’s best interest at heart. This can lead to various problems, both cosmetic and behavioral, so it’s important to do your research before you get one. 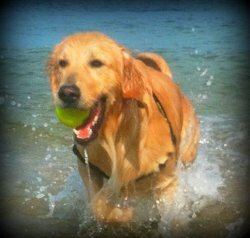 Unlike other dog breeds, the Golden Retriever is a man-made creation stemming from the late nineteenth century. It is a blend between a traditional Flat coat Retriever and the now defunct Tweed Water Spaniel. As its name implies it was bred to work alongside hunters in wet and marshy areas, retrieving ducks and other birds that had been shot over areas inaccessible to the hunters. The breed was first shown at a dog show in 1908, and has been ever present at the American Kennel Association shows ever since. •	The coat should be wavy, and feel soft and smooth to the touch. •	The coat color can range from cream to a golden red, and traditionally they should be a dark coppery color. •	They should have dark pigment around the eyes, nose and gums, but be wary of dogs where the black pigment extends back from the mouth into the rest of the face. •	The dog should be around 65lbs in weight and should come up somewhere between your knee and your thighs. •	Patience – a Retriever will withstand the most incredible amount of tail pulling and hair tugging, making them the ideal pet for families with small children. Because they enjoy human company, they will actively seek out children as potential play mates. •	Eager to please – Every pure bred Golden will form an instant bond with their family and will do anything they can to please them. This makes them very easy to train, and this process is made even easier due to their love of food. They are little bit more sensitive than their Labrador cousins, so you’ll need to be wary about how you go about reprimanding your dog. •	Grooming – The Golden is a long haired dog, and the wavy hair means that they tend to shed more than most other dogs. This can be kept under control by regular grooming and brushing sessions, which your dog will enjoy. You’ll also need to invest in a dog hair attachment for your vacuum cleaner, as the hair is long and fine and tends to stick to fabric. Trying to find a pure bred Golden Retriever can be difficult because they are one of the most popular type of dog breeds in America. You can tell a dog that comes from a bad breeder by looking at their health history. Bad hips, eyes and skin are all signs that the animal is the result of a bad breeding program. Remember that Goldens are a happy go lucky kind of dog, so you shouldn’t have any behavior problems to contend with, and any shortness of temper and snapping can be a sign that the dog isn’t pure bred.